Last year Mr. Wonderful and I took a romantic trip to England. And you know I had scissors and paper in my pocket! so I thought I'd give you the inside scoop and show you a valentine made from some of the dies. 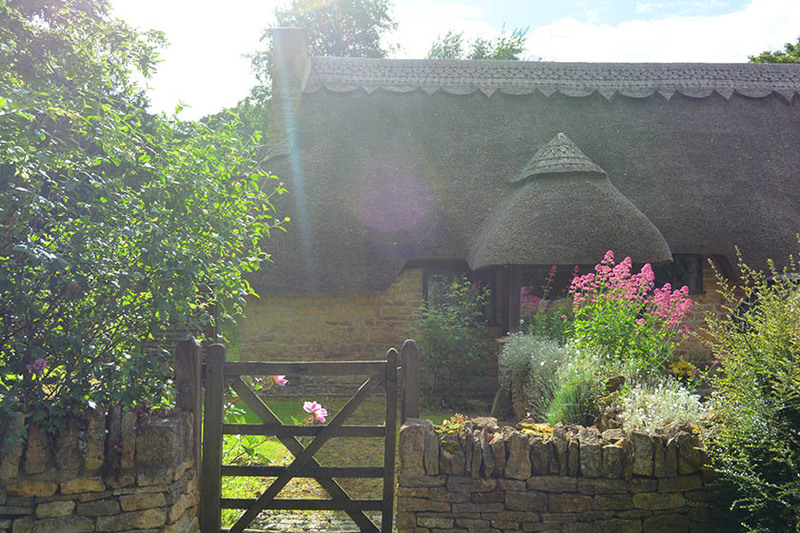 The Cotswolds are like the best old storybooks come to life. 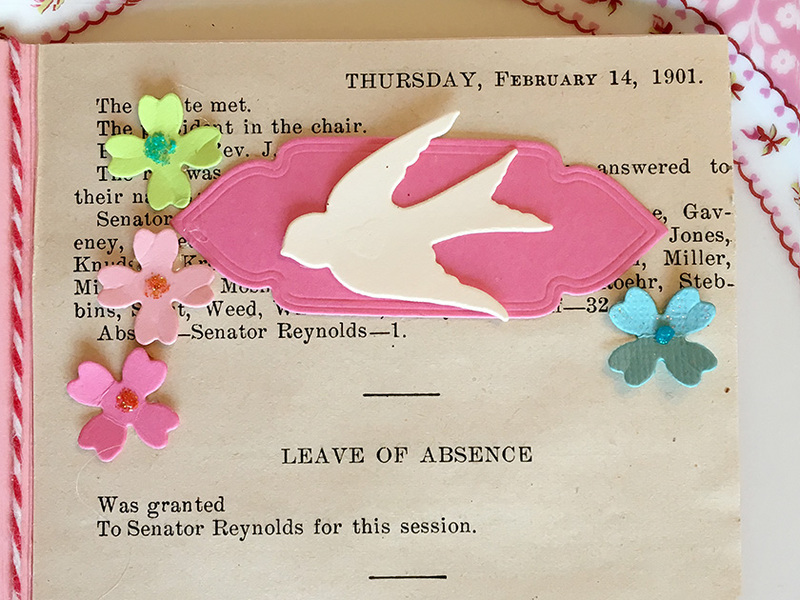 And it was so much fun to bring those flowers to life as hand cut paper, then watch Spellbinders turn them into crafting dies for paper, fabric and more. 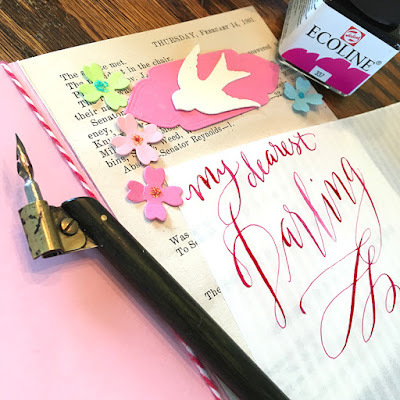 I used the bird topiary die and the swallow and heart die from Spellbinders Joyous Celebrations collection for the birds and florals and lettered a bit with a dip pen and liquid watercolor. Ready to hop to my friend Debi Adams' blog? Click here! Thank you for creating such AMAZING and GORGEOUS dies, Sharyn!! I am loving them all! Hugs! Amazing set of dies!! Thanks for this collection :) And lovely inspirations! Love these dies. Perfect for Valentine's Day, weddings, anniversaries, etc. Great release. Love your amazing and beautiful dies. Your new set is absolutely lovely! How neat to see your inspiration! 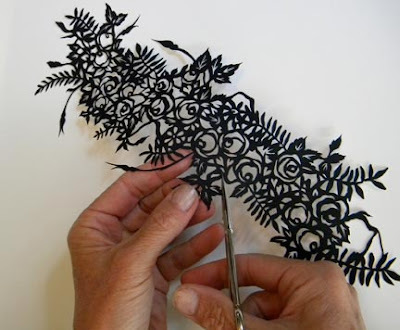 I love intricate papercut images but I can't imagine cutting like you do by hand... I have a tough enough time with fussy cutting stamped images. lol! These are definitely going on my wishlist! What an awe inspiring collection! How fortunate to be so talented. 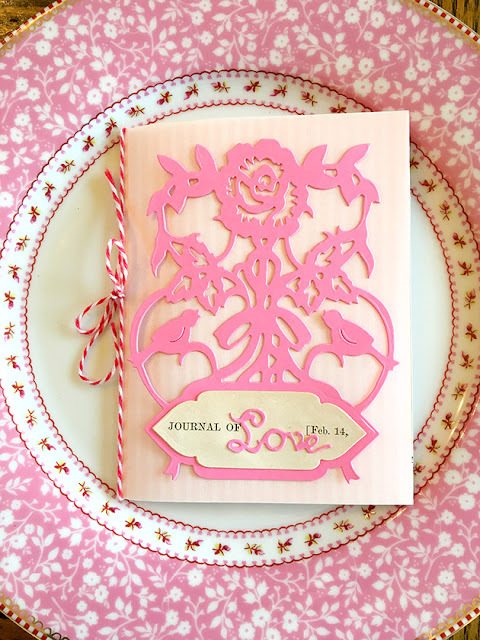 This hop is my introduction to your craft and you have two things near and dear to my heart - roses and hand lettering. These dies are soooo beautiful. Congratulations and best wishes! 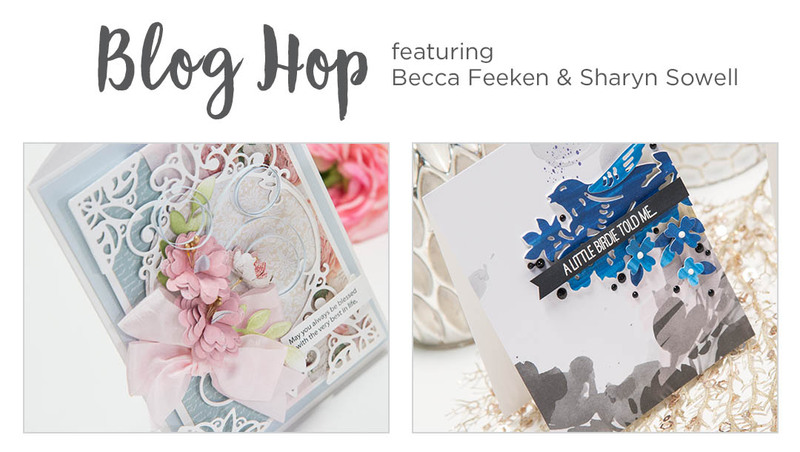 Just love blog hops, especially if it is anything to do with Spellbinder dies and Becca. Very nice dies. Love the dies. All so beautiful. Lovely is the word and thanks for sharing your creative talents. Beautiful Valentines! Love the intricate design of the dies! Beautiful, romantic and elegant collection. This is the first time I've seen some of your work Sharyn - to say it in a couple of words, I'm gob-smacked! Absolutely fabulous! Such beauty!! 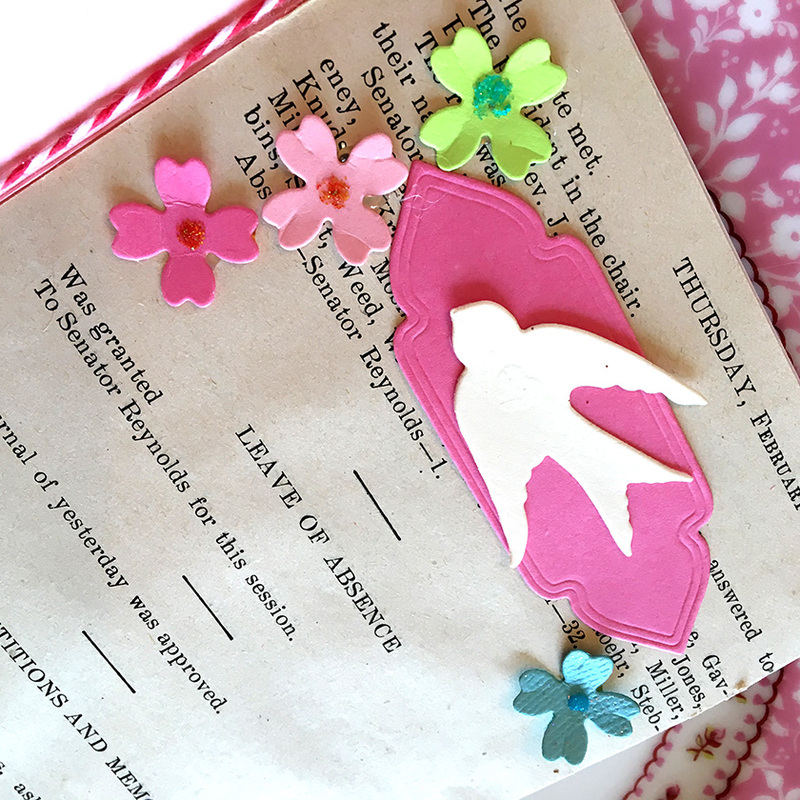 Just love these fabulous dies, Sharyn. will have to put them on my wish list. Amazing collection and wonderful inspiration! You are so clever! Sigh! I LOVE the photo of the English Cottage! ;) AND what you were working on while there..... "Sherenschnitte!" BEAUTIFUL!!!! I think you are RIGHT! They would look LOVELY as Wedding, Valentines, Love cards or even mixed in with Becca's dies, you think? My mind is working now! LOL ;) BEAUTIFUL DIES!!!!!!!!!!!! OMG, To be so talented, it must be an amazing feeling to create dies like this, I just can't imagine.They are just STUNNING, Gorgeous, just so UNIQUE and Beautiful!!! I just adore how they came out and I can imagine myself using it in so many ways for so many occasion's. Your trip must of been amazing also and of course inspiring, I am lucky if I get to get out of the house once a year, LOL. Thanks so much for sharing today, I really enjoyed it. I am blown away by your amazing talent with scissors! The fine detailing is exceptional. How wonderful for us that Spellbinders created dies with your gorgeous designs so that we can achieve a similar look. Love your talent! Congratulations on your own dies with Spellbinders! Very pretty. I like how you brought these flowers to life. Lovely creations! Thanks so much! Such amazing dies! I’m in love!! 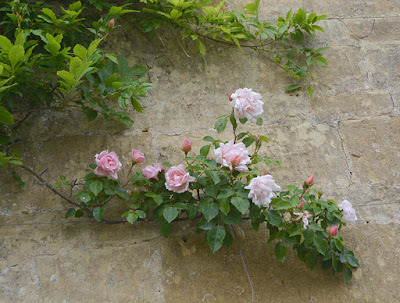 I love roses and these are so beautiful! Thanks for sharing! Oh I don't know how you can cut all the Amazing Pieces.... WoW I have a hard time cutting a square... lol...Thanks for sharing.. Your cut work is STUNNING!!!!! Thanks for all the inspiration! Wow! The dies are awesome but your hand cutting is unbelievable! Your creations are gorgeous! Love the fact that your inspiration is from a romantic trip to England. The dies really remind me of fairy tales and some vintage secret garden! You are so talented! Congrats on your collection!! Gorgeous! Can't believe you hand-cut these items! I would be too nervous about mis-cutting as I near the end. lol. 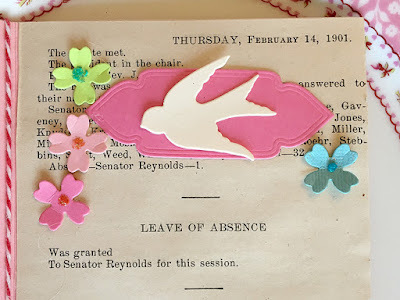 Thank you for sharing your inspiration for these beautiful dies. I had no idea you made paper cuttings (so beautiful) for Spellbinders to reproduce in a die. This new release is beautiful. Looking forward to using some of them in my own card creations. Love ALL your dies, I have quite a few of them! Thanks for sharing your God-given talent! What a gorgeous collection you have created! How incredible it is to have a part of your romantic getaway to England be captured forever with these dies and something you can put into your creations every time. Thank you for sharing! Wow, just beautiful! I love reading the back story behind the design! You are one amazingly and talented lady. Just WOW! So fortunate to be able to share your talent. Sharyn, your collection is amazing and well done. Congratulations on it! Lovely, splendid designs. Thank you for sharing your talent with us and creating such gorgeous designs. Wow, these dies are absolutely amazing! I love them!! These are so beautiful! Congratulations!!! And gorgeous designs too! Congratulations on a gorgeous array of dies. So pretty! 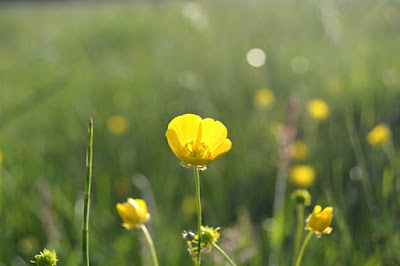 I can smell the springtime looking at your photos and work! Gorgeous card. Love all the die cuts! These are amazing and I am in awe of your talent! Wow! Just love those dies! You make spellbinders shine! Beautiful creations!Thank you for sharing your talent! Thanks for creating these stunning dies for us to use and create with. Your talent is amazing ! Wow! Amazing scissor work and lovely dies! Wow, beautiful projects, gorgeous photos and your talent is awesome. So pretty! I love flowers. Thank you for sharing! 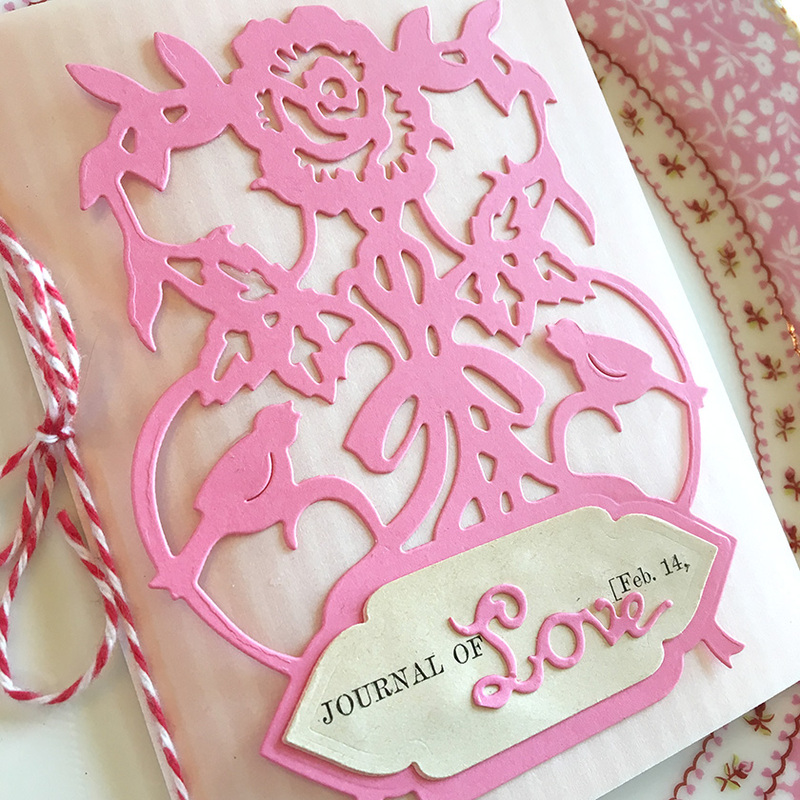 BEAUTIFUL project with those elegant dies. A drumroll for the winner!